Following this her team took to Insta to clarify this and wrote, “Krish Jagarlamudi is the director of #Manikarnika and will remain so. 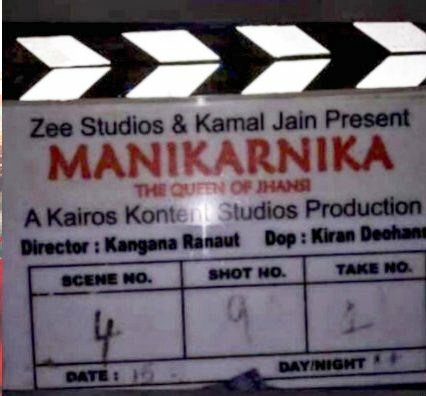 #KanganaRanaut has stepped in to shoot just the patchwork on his behalf while he fulfils his commitments in another movie, to make sure that #Manikarnika releases on 25th Jan 2019. The clapboard is merely to avoid on set confusion.” Krish Jagarlamudi is currently busy with the NTR biopic. Kangana’s last few projects did not do too well at the box office and therefore it is really important for her that films at her films work to re-instate his position and make her a credible entity again, trade wise. Industry insiders and fans who have been closely following up on Kangana’s career often opine that she is known to be taking over the director to tweak portions or film in general.